Irving Street, from the area around UC Medical Center out to about 26th Avenue, was and is a bustling shopping corridor, though the merchants and the merchandise have changed considerably over the years. In fact, the only similarities between Irving-THEN and Irving-NOW are the places that dispense life's basics—Italian food, ice cream, and money. Virtually all of the other businesses have been replaced by stores and restaurants that offer items that are more aligned with life in the second decade of the new millennium. Here's a stroll back, with some of the places that I recall from childhood in the 1950s and 1960s, up to the end of the 20th Century. St. John of God Church (NE corner of 5th)—This was originally an old Protestant church from the 1920s, with a classic Craftsman interior, which became the Catholic Newman Club for UCSF in 1967, and subsequently its own parish. It was the site of several weddings in the 1970s for college friends who wanted a smaller, more intimate location than St. Anne's or St. Cecilia's. The priest here was widely regarded as being easier to work with than some older pastors when couples wanted a ceremony with John Denver guitar music and their own unique vows. Avenue Typewriter and Adding Machine (north side near 6th)—Office machine repair shops were once popular neighborhood places. My faithful Smith-Corona electric, in its black carrying case, made many a visit here during high school and college days. My most costly repair still gave me back change from a $10 bill. The Recovery Room (first block of Judah)—Not on Irving at all, but close enough, and I always think of it as being there. This was a little hole-in-the-wall restaurant near the corner of 6th Avenue that was popular with USF and UCSF students in the 1970s. You might meet a girl at 50-cent-a-pitcher beer night at The Front Room Pizza (either Richmond or Sunset location), but the place to take her on a first date was the Recovery Room, with tablecloths, candles, and wonderful veal dishes—try to find any of those three things in a neighborhood restaurant today! The Embers (south side between 6th & 7th)—Another classic hangout for USF students, particularly guys, living in the Sunset in the early 1970s. Forty years later, several classmates still shake their heads in painstakingly clear recognition of some stupendous hangovers that began there. Record Factory (SW corner of 8th)—Hip record store that took over the staid old bank building, much to the horror of long-time neighborhood residents. Ended up reverting back to use as a variety of different banks years later. Villa Romana (south side between 8th & 9th)—Classic dark and smoky old time restaurant. Great to go there as a high school senior in the late 1960s when the harried waiters might look the other way and serve red wine to everyone at the table. This place also featured killer garlic bread whose fragrance was resistant to showering, shampooing, and the strongest mouth washes—it took days to wear off. When dining out with a group, the rule was "everyone eats the garlic bread or else no one eats the garlic bread". 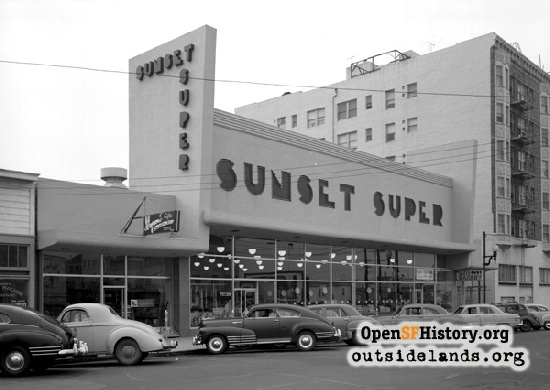 Sun Valley Dairy (NW corner of 10th)—My next door neighbor's dad loved to visit there on the weekends and pick up quart bottles of strawberry milk, which we'd consume with the kosher salami that he always bought in the Jewish delis along McAllister Street in the Fillmore District. Maxwell Shade Shop (SW corner of 12th)—Great little corner store that supplied a basic item, custom-made window shades, for decades. I remember thinking recently that some of yesterday's most basic household items would be tough to find in a treasure hunt contest today. Gone since about the turn of the millennium. 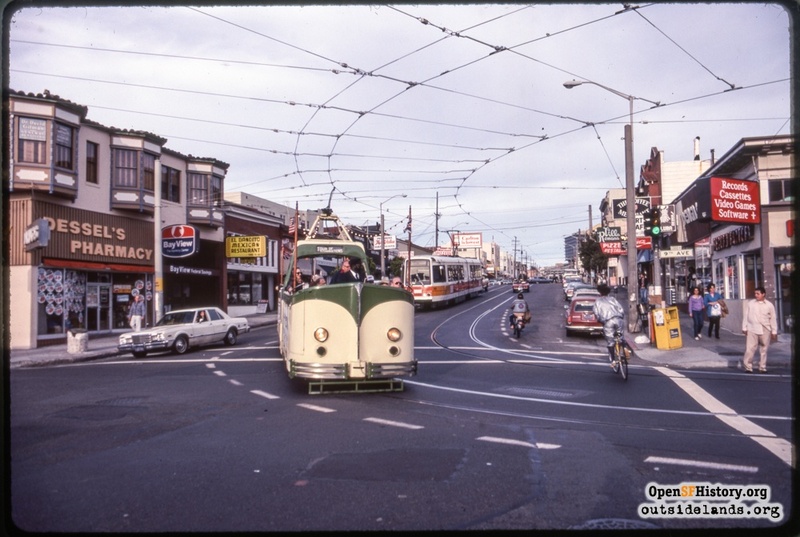 Park & Shop (at Funston)—This was 1960's answer to grocery shopping. The big parking lot, plus the "modern" apartments at the far end, facing Lincoln Way and the Park were a developer's dream half a century ago. The grocery store underwent a huge facelift in the late 1990s, and the owners jammed more items than ever into that space. If it were built today, the store might easily fill the entire lot, with parking on the roof. St. Anne's Parish (at 14th Avenue)—Just north of St. Cecilia's, but without the rivalry that SC always had with Holy Name parish to the west. Our family always attended St. Anne's parish festival as well as the annual novena to St. Anne that was held every July. The church used to be a non-descript one-tone beige color, but in the 1980s, it was given a fresh paint job that really made the images above the entrance pop. When I attended S.I. from 1966-70, more than half the student body came from the "Big Four" parishes in the Sunset—St. Anne, St. Cecilia, Holy Name, or St. Gabriel—now, only about one-third of S.I. 's students live in San Francisco, with the biggest single block, nearly 40%, commuting in daily from San Mateo County. 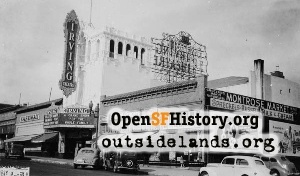 Irving Theatre (north side between 14th & 15th)—A classic neighborhood movie house in a Spanish-Moorish style, with a small tower and open arches that resembled St. Cecilia's Church. 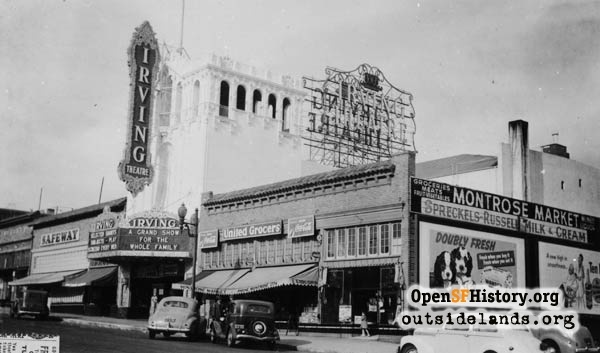 In addition to the standard vertical marquee that ran down the face of the building, there was also an enormous sign on the roof with individual letters spelling out IRVING THEATRE in individual large white letters, making it a neighborhood landmark, second only to St. Anne's. I was there for the last time with my parents in the late 1950s to see a Jerry Lewis movie. The lobby always seemed much more elaborate and ornate than the nearby Parkside, with twin stairways facing the entrance, rather than being tucked into a side wall. Torn down in 1962. Robert's Pastries (SW corner of 15th)—Delicious cakes and great Danish pastry. One of Mom's cousins had an elderly maiden aunt who lived her whole life in the family home, built circa 1900, up the hill on 9th Avenue. "Aunt Mary" could often be found in Robert's, dishing the dirt about any and all goings-on in St. Anne's Parish, as she took her daily constitutional up and down Irving. Ironically, Robert's went out of business shortly after her passing in the 1990s. Johnny Nippon (north side between 15th & 16th)—I first discovered the place in the early 1980s, and was always impressed with the food, service, prices, and cleanliness. They had a great entrée at lunch and dinner, consisting of filet of sole, stuffed with creamed spinach, and covered in a creamy sauce containing shrimp and crab, served with a rice pilaf and a green vegetable—fantastic. Full bar, great dessert menu, easy parking, and gone from the scene more than five years ago. Mohawk Station (SE corner of 16th)—One of the last truly "old" gas stations in San Francisco, dating from the years around World War I. Built of brownish-orange brick, with just a single island for service, it's been a long time since they dispensed gasoline. History buffs should go and get a look before "progress" does the place in for good. 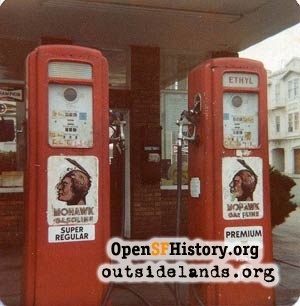 This was just one of many gas stations (Texaco, Richfield, Flying A, etc.) that used to dot Irving and so many other business streets in the western neighborhoods until about the 1980s when they began to disappear, one by one. San Francisco Public Library - Sunset Branch (SW corner of 18th)—This branch was my home away from home while at USF. For some reason, it seemed to be one of the city's last libraries to maintain open hours of 9 a.m. to 9 p.m. on weekdays. (For the benefit of younger readers, those were considered to be "standard" library hours, just like the "standard" banking hours used to be 10 a.m. to 3 p.m., and extended to 6 p.m. on Fridays.) As an original Carnegie library building, it exuded the warmth and charm of an old world library, with steam heat, sturdy high-backed wooden chairs, brown linoleum floor, and the unmistakable smell of books and library paste. Jefferson School (SE corner of 19th)—One of the few brick structures in SF. The old arch-windowed auditorium is the sole survivor of the 1959 fire that destroyed the classroom building that fronted on 19th Avenue. Newspaper accounts of the time identified the arsonist as a pupil who was trying to cover up a bad grade. In a supreme piece of irony, ten years later, that same individual was hired to be the night watchman while the new S.I. campus was under construction on 37th Avenue. A group of seniors picked up the story from the horse's mouth, but the administration never knew. Sherry's Liquors (NW corner of 19th)—Famous for their displays of "I Bet You Can't" glassware (half-gallon size martini glass, beer mug the size of a small trash can, etc.) with the dare emblazoned on the side in large red letters. Those items, plus gallon bottles of Chianti, with 5-foot tall necks, were classic 21st birthday gifts in the early 1970s. Ernie's Neptune Fish Grotto (north side near 19th)—This place was my very first memory of Irving Street, since my parents liked to have dinner there about once a month in the early 1950s. Introduced to seafood at an early age, I was a big fan of crab and shrimp cocktails, and was one of the few kids in grammar school who didn't retch violently at the smell of fish being cooked at home on Friday evenings. Kieser's (south side between 19th & 20th)—With its memorable sign "Since '36", this was the classic neighborhood coffee shop with deep maroon vinyl booths, and waitresses who looked like they had been sent over by Central Casting. Resembling the Tennessee Grill over the hill on Taraval, Kaiser's began as a creamery, with incredible milkshakes and desserts, and gradually evolved into a full-service coffee shop that featured jars of the world's best strawberry jam at each table—no little plastic packets here. Vanished from the scene in the 1990s to be replaced with a Vietnamese restaurant. Brooks Stationery & Records (south side near 20th)—A full service neighborhood stationery store plus records—try to find either of these businesses today. Gone by the early 1980s. Sunset Sporting Goods (north side near 20th)—A local sporting goods shop that carried everything from Converse Keds to regulation basketball hoops and fishing equipment; total convenience and close to home. Gone by the 1980s. Lucca Market and Deli (SE corner of 20th)—Irving's answer to West Portal's Easy-Freezy. Always open and ready with pricey last-minute items. Kentucky Fried Chicken (NW corner of 20th)—One of the first fast food places to enter the neighborhood, circa early 1970s. Taco Bell was added to the line-up when the companies found themselves with the same corporate owner back in the 1990s. Norge Coin-Operated Dry Cleaners (south side just west of 20th)—One of many in a chain that operated all over SF in the 1960s and 1970s (there was another on the inner part of Irving and another on Ocean just east of 19th). All the machines were front-loading, aqua blue in color, and cleaned a stack of dry cleaning for just $2 a load. The fumes were probably lethal, but combined with all those deli and bakery aromas, it spelled Main Street, USA. Just a couple of doors away there was another chain outlet, 1-Hour Martinizing, which also had many locations across SF. Were there more dry cleaners around town in the old days? Must have something to do with the loosening of dress standards by major businesses over the last couple of decades. Casual Fridays have expanded into the everyday Casual Workplace. Golden Brown Bakery (north side between 21st & 22nd)—Great neighborhood spot for years, with a variety of cakes, cookies, etc. During the 20 years that I lived on 22nd Avenue, I held a New Year's Day open house for family, friends, and neighbors, and each year, I'd purchase a chocolate sheet cake from Golden Brown, which they had decorated with a flat plastic clock face, hands approaching midnight, and tiny plastic champagne glasses embedded in the icing (I still have a kitchen drawer full of that stuff). I was not the only one who relied on them for a cake like this, as there were always several lined up, awaiting pick-up every New Year's eve. The bakery vanished into a cloud of cinnamon and almond paste sometime in the mid-1990s. Bank of America (SE corner of 21st)—Holding down that corner for the last 75 years or so, though previously in a more subdued color scheme of grayish-green. 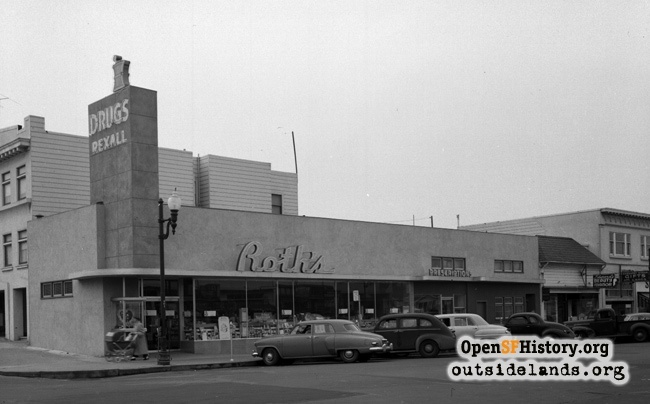 Roth Drug (SW corner of 21st)—Housed in a building with a modern, streamlined design, with a mortar & pestle high up above the roofline, this was another of the neighborhood druggists that carried a variety of goods, in addition to the pharmacy. Like so many other small neighborhood places, it was done in by the big chains in the 1990s, and the building has been substantially altered for a group of offices. See's Candies (south side between 21st & 22nd)—Old stalwart that held out its neighborhood location long after other neighborhood branches on West Portal, Upper Market Street and Chestnut Street disappeared. Gone since the 1990s, now to be found almost exclusively in malls. Christmas tree lot (NE corner of 22nd)—When Walgreen's acquired the building next door and paved over the corner lot for parking in the early 1980s, the remains of all those long-gone Christmas tree continued to pop up through cracks in the asphalt every winter. Christmas trees have long memories. 22nd & Irving Market (SW corner of 22nd)—Once a full-service grocery store, it became an incredibly successful produce-only outlet circa 1980 or so, jamming traffic in all directions. It was as though people had never seen fruits and vegetables before. Florence Delicatessen (south side just west of 22nd)—Home of the world's absolute BEST ravioli. 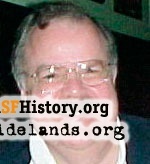 It was an old-time deli that had strong smells, just like Herman's on Geary. The combination of pickles, sliced meats, cheeses, and marinated everything (mushrooms, olives, etc.) was guaranteed to clear your sinuses instantly. Many of the goods were arranged in white porcelain-steel serving dishes in the big front window. It was absolutely impossible to walk down the street and not stop in to buy something. Gone since the 1980s or so. And is it my imagination or did Irving Street not have more delis than most neighborhood shopping streets?? Pacific 5 & 10 (south side between 22nd & 23rd)—Not quite a Woolworth, but the same retail concept, along with big gold lettering on a sign with a bright red background. H. Sommer Furs (north side near 23rd)—Yes, a furrier on a quiet neighborhood residential street, and no one ever threw red paint or became at all upset over the concept. Many middle-class ladies were pleased to have a mink stole hanging in the closet and would wear it on special occasions such as going to church on Sunday or out to dinner on a Saturday night. Furriers did a steady business of "glazing" and "cold storage" which was a bit of a push, given the usual foggy summertime weather in the Avenues. Wells Fargo Bank (NW corner of 24th)—Like its neighbor Bank of America up the street, Wells has been holding down this corner for decades. Their customers must have applauded the City's move in the mid-1990s to create additional diagonal parking by reducing the width of the sidewalks at the ends of many of the Avenues adjacent to Irving Street, but it's still tough parking anywhere near this corner. Andre's TV (SW corner of 25th)—Long-time, friendly neighborhood merchant that could get a replacement TV delivered and set up within the hour—an important consideration when the neighborhood began to fill up with retirees who were glued to the tube in the days when cable first became so popular, beginning in the early 1980s. Sunset Super (south side between 25th & 26th)—A holdover from the days when the neighborhood was dotted with various grocery retailers, both corner stores and larger supermarkets. This place was famous for its meat, poultry, and fish, departments, which were run by the legendary Petrini's, and service throughout the store was excellent. Increasing parking difficulties and more competition from other grocery retailers with lower prices did them in, and the place became a specialty Asian food store about the turn of the millennium. Currivan's Chapel of the Sunset (north side between 25th & 26th)—The neighborhood undertaker, managed by the father of an S.I. classmate. The so-called "ultra-modern" building from the 1960s (with a look similar to Holy Name's Church's white "circus tent" motif) caused many tongues to wag in criticism, yet its location provided a level of convenience that many in the neighborhood came to like. Currivan's closed its doors and the building morphed into a highly done-up branch of the SFPD credit union in the 1990s. Sean's Antiques (SW corner of 26th)—You could find anything from a dining room table, to the dishes, glassware, and silver to use on it, to the rug to place under it at this great store. It was a walk back in time to Grandma's house, circa 1925, to see the knick-knacks, paintings, and crystal that filled this place. The 1989 earthquake caused quite a bit of damage to the merchandise, but the owners reopened quickly. Gone for about 10 years now. As I look back, Irving is a street of paradoxes: thousands of cars, but not enough parking spaces, and almost no gas stations compared to what there used to be. There's now even a traffic signal at 20th Avenue, just to control all the congestion. The delis and small grocery stores are few and far between these days, though there are many, many more restaurants, catering to every taste imaginable. The small neighborhood drug stores, liquor stores, and bars also seem to be fewer in number, replaced by many more stores selling fruits and vegetables—probably a good thing for overall neighborhood health. Clearly, hair and nail salons seem to have multiplied ten-fold. St. Anne's and the old library still stand out as architectural gems for passersby to enjoy, even more so today than in the past. For all its changes, Irving Street remains a vibrant part of the retail scene in the Outside Lands. Page launched 18 August 2010.